The public mob lynching last week of a young Afghan woman has sent shockwaves across the country and beyond. This horrendous crime should be a wake-up call for all Afghans, writes Saeeq Shajjan from Kabul. Last week, on March 19, a young woman in her late twenties was beaten to death by hundreds of angry men inside the Shah-Do Shamshira shrine in downtown Kabul. 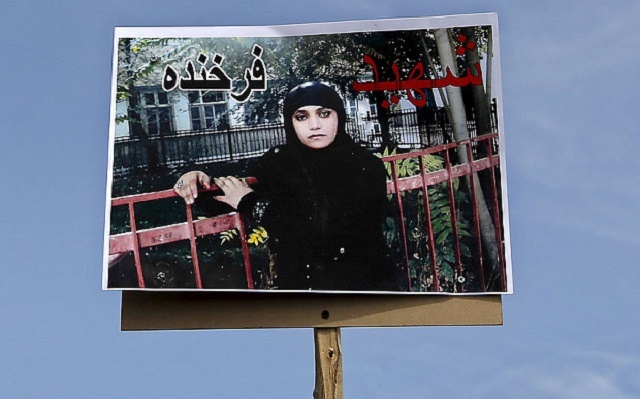 Farkhunda’s body was beaten, run over by a car and dragged behind it, before being set ablaze in the Kabul River. Her murderers had accused her of burning the Qur’an, the Muslim holy book. Smartphone videos that have been circulating online showed the young woman, donning a Hijab, desperately trying to explain her version of events, as an angry man yells that she was “instructed by the Americans” to burn the holy book. Another man asks her to come forward, as she continues to deny burning the Qur’an. Farkhunda, like all Afghans, is constitutionally guaranteed the right to life. But her death, in the most brutal and barbaric manner, was in complete contravention to that most basic of legal and human rights. A human being should never kill another unjustly; there is a court and judicial system to take care of this. Under the law, the police are obliged to “ensure and maintain public order and security; ensure individual and societal security and protect their legal rights and freedoms”, but on Thursday police officers put on a display that was in complete opposition to their public duty. Indeed, photos and video clips taken during the incident show police serving as facilitators to the crime. They had forgotten their duty to protect lives, too busy revelling gleefully in the extrajudicial killing unfolding before their very eyes. As a nation, we have reached a new low, which raises the question: has death become the default punishment for every act we deem intolerable? Is this the standard, the Islamic values we have been taught? While President Ghani has taken the right action in ordering the Ministry of Interior to launch a full investigation into the heinous act, this alone will not suffice to address the real issues at stake. The government must demonstrate its commitment to the protection of individual rights guaranteed under the Constitution by closely following up and insuring that those involved are brought to justice. The government must issue a legal verdict making absolutely clear that no Afghan should be allowed to act as judge and jury of his/her fellow citizens, and to punish others based on personal whims and prejudices. All those involved in this tragedy – arguably the most monstrous and atrocious crime Kabul has ever witnessed – should be identified and brought to justice for taking the law into their own hands. The government of Afghanistan must also demonstrate that the constitutionally guaranteed rights of each individual have the utmost value, and that they will protect those rights at all costs. Now is the time for the government to demonstrate that, unlike the previous administration, it is absolutely dedicated to protect individual rights, in particular the most fundamental of all: the right to life. A failure would result in a nation losing its faith in the government, particularly the police, the force meant to protect the lives of its citizens. Everyone is shocked but, now is not the time to surrender to the feeling of horror and disgust. Now is the time to learn the costliest of lessons. It is the time to insure that our people are fully aware of the value of individual rights, human dignity and the supremacy of law. It is up to all of us – activists and citizens alike – to insure we never again have to mourn another Farkhunda.